High visibility, Vehicle Activated Speed Sign solutions are suitable for both road and parking applications. All signs are manufactured to comply with Highways Agency technical specifications. the intelligent SMD LED technology ensures low power consumption, life longevity and the design is easy to use. A SID has a seven segment amber LED display which will show the exact speed of oncoming vehicles, along with a ‘SLOW DOWN’ message when they are travelling over the set speed limit. This will prompt drivers to correct and lower their speed and is an effective speed calming solution. SMD LEDs are energy efficient and ‘no-fuss’ alternatives to the traditional LED. The light emitted from the SMD is targeted, meaning light pollution is minimised and only the necessary light is used. This also improved driver legibility and provides an excellent contrast ratio. The dome shape of the SMD requires less cleaning than a traditional LED, as well as being able to still be clearly visible even in direct sunlight. 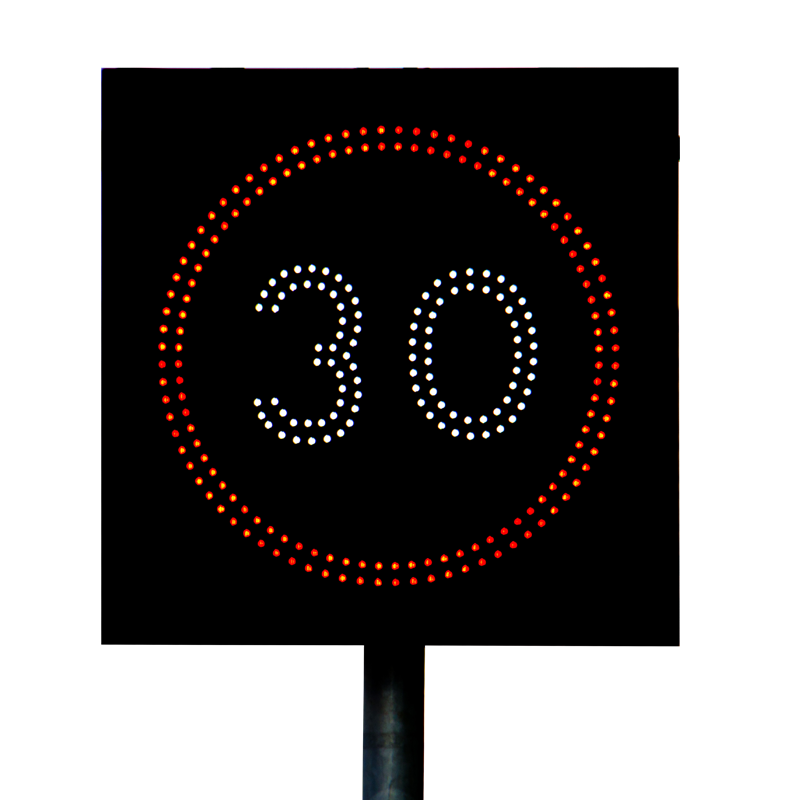 SLR speed signs are activated by speeding vehicles and will display the road’s speed limit, prompting the driver to check and correct their speed. As standard, a SLR has red and white TSRGD LED symbols, which can display speeds from 5mph to 45mph in multiples of 5, set in a red roundel. 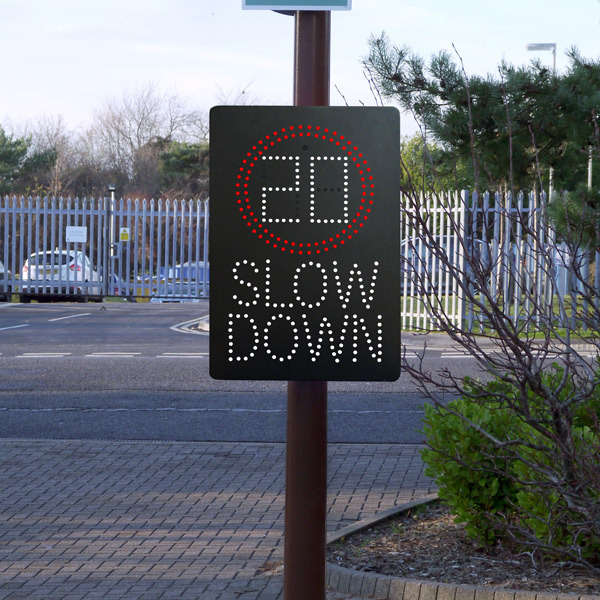 Below the speed is a white LED message of ‘SLOW DOWN’, so the sign cannot be missed by passing motorists. 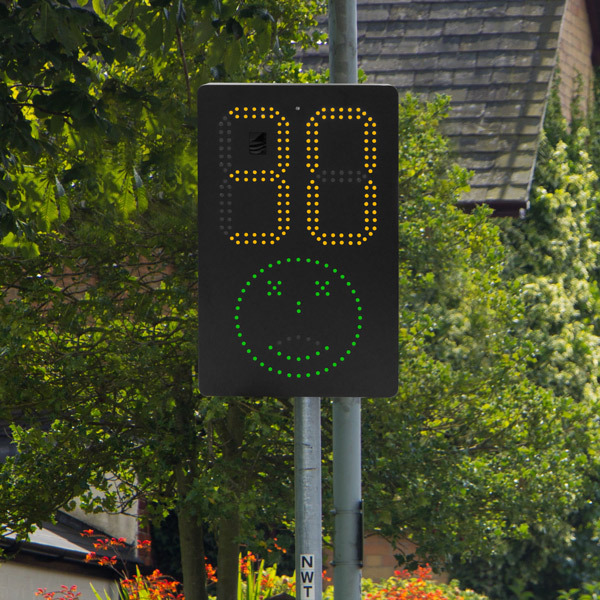 NEW to our range of Vehicle Activated Speed signs is SAM, Smiley Activated Message sign. Rather than a 'Slow Down' message, the 'happy' or 'sad' face can be used as positive feedback to a driver's speed. When the radar detects a vehicle travelling within the speed limit, a green 'smile' will appear along with their speed, and when a vehcile is detected to be tarvelling over the speed limit, the sign will flash a red 'sad face' with the current speed of the vehicle. 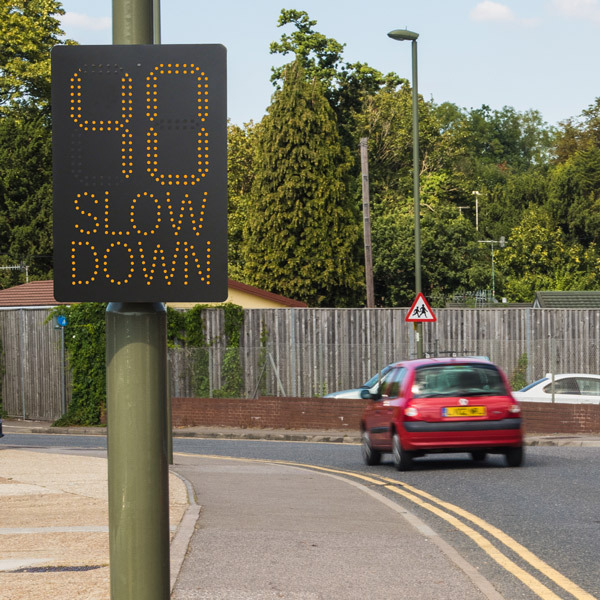 The face as opposed to the traditional 'Slow Down' message is becoming increasingly popular as a more 'friendly' speed reduction method. For more information, visit our Downloads page.